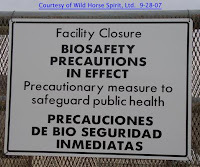 Yesterday, Betty Lee Kelly of Wild Horse Spirit, Ltd. visited BLMs Palomino Valley wild horse and burro holding facility in Northern Nevada due to an outbreak of salmonella that has claimed at least 130 wild horses since the outbreak began. 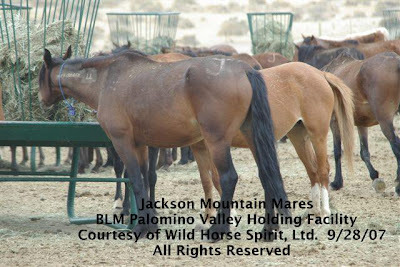 Conversations with John Neill, Palomino Valley’s Center Manager, revealed little about the latest crisis wild horses are facing, preferring instead to refer any questions to Nevada Wild Horse & Burro Lead, Susie Stokke who was unavailable for comment. The facility is currently holding 1,350 wild horses of which 850 are estimated as remaining from the Jackson Mountain Herd Management Area removals. 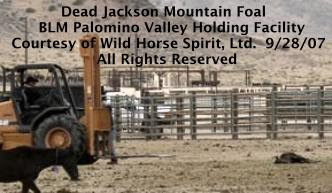 Official reports for the Jackson Mountain HMA stated 990 wild horses were removed between 8/28/07 and 9/14/07 with six being destroyed and one fatality. Symptoms included diarrhea and death but when questioned about the number of wild horses that might be affected, Neill’s only reply was “cultures have been taken on several horses”. 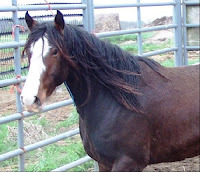 Despite their current condition, it is unknown if wild horses may still be shipped to other facilities such as the Carson Prison or “elsewhere”. 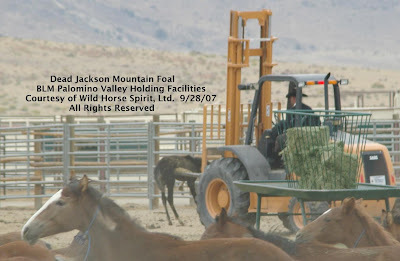 Cattoor Livestock Roundups was the contractor used for the Jackson Mountain wild horse removals and questions about Cattoor’s trailers being sanitized since discovering the Salmonella outbreak were also met with uncertainty. On viewing the corrals, it was noted that a high proportion of foals and very young horses were completely alone. When questioned where their mothers were, Neill’s only reply was, “Some were not able to be connected back up to their mothers.” Many of these foals appeared to be four months or under and there’s additional concern that many of them may be too young to survive on their own. The following photos were taken yesterday at the Palomino Valley facility around 11:00 a.m. BLM staff was still in the process of cleaning up and pictured here is a foal that had expired only moments before the forklift came to “dispose” of the body. An extremely weak foal - will she make it? A great big special thanks goes out to Wild Horse Spirit, Ltd. for sharing these pictures with all of us and for trying to get answers on what is really happening at the BLM Palomino Valley Holding Facility and this newest tragedy for America's wild horses. Salmonella is not uncommon in horses and they may carry the bacteria in their digestive track without becoming ill. However, when horses are in weakened conditions or are very young or old, they are more susceptible to succumbing to its effects. Dr. Al Kane, veterinarian for the U.S. Department of Agriculture, stated that many were extremely weak from lack of food and water due to drought conditions and their weakened condition made them more susceptible to the bacteria. 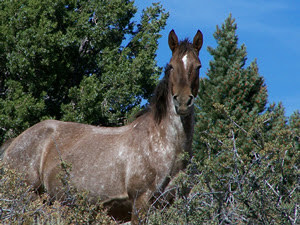 There are further speculations as to why the Jackson Mountain wild horses have been hit so hard, which vary from contaminated water troughs, BLMs long disputed exclusive diet of overly rich alfalfa fed to wild horses and burros coming straight off the range, as well as the stress of being driven by helicopters during capture operations. The BLM has no established limits on the distances wild horses and burros may be driven and there was significant public protest about this issue to BLM during Nevada's annual hearing on May 16, 2007 regarding the use of helicopters and motorized vehicles to capture wild horses but public concerns were ignored. After conducting a thorough review of their Standard Operating Procedures (SOP), which lasted less than an hour, BLM responded to the variety of public concerns that everything they do is safe, humane and appropriate. American Wild Horse Preservation Campaign rebutted BLMs "in depth" review by stating; "BLM conveniently omits injury statistics and is able to issue such low mortality rates because almost no deaths are deemed by officials a "result" of the removal operations. Many injuries/deaths sustained during round-ups are conveniently attributed to natural causes. Reports of horses that later have to be euthanized due to injuries sustained during capture are common." Wild horses have often suffered outbreaks of strangles, a highly infections and serious respiratory disease that can kick in after being severely stressed, such as being driven for miles during helicopter captures. * What studies have been done on the physical effects of driving wild horses and burros by helicopters? *What is the absolute limits in terms of distance that wild horses and burros can be driven before physical damage begins? *What are the temperature limits that should be followed? For example, running wild horses and burros at freezing temperatures? During extreme heat? Almost 900 wild horses were captured in Wyoming this past January during temperatures so cold that the military was airlifting food for livestock into Colorado and 178 wild horses at the Nevada Wild Horse Range were driven during triple digit temperatures that were tying Nevada record highs. To date, no attempt has been made to address the potentially fatal results of the Standard Operating Procedures (SOP) BLM employs during capture operations or the health conditions that often result. Why should they? There is no one they must answer to anymore. The Jackson Mountain wild horses join a long list of other "non-capture related" fatalities, merely classified as a result of natural causes due to BLMs vague and undefined SOPs - Standard Operating Perils. -Photo of Capture Plan Map taken from May 2007 Jackson Mountain Wild Horse Gather Plan, Preliminary Environmental Assessment, NV-020-07-EA-10, page 45. 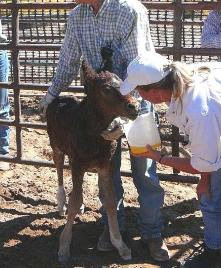 -Photo of electrolytes being supplied to young foal during the September removals of the now zeroed out Silver Peak HMA from the May 2007 Roberts Mountain Complex Wild Horse Gather Preliminary EA, NV062-EA07-120, Appendix A, page 52. (3) Department of the Interior, BLM, Winnemucca Field Office, Jackson Mountain HMA, Wild Horse Gather Plan, August 2007,EA # NV-020-07-EA-10. A prominent horse advocate has experienced a recent deep loss. The following is dedicated to her and her loved ones. Is a new documentary by filmmaker James Kleinert of Moving Cloud Productions scheduled to screen on Wednesday, September 26, 2007 in the LBJ Room on Capitol Hill in Washington, D.C. for both Senators and Representatives. The American Wild Horse examines the politics behind the Bureau of Land Management’s controversial policies regarding wild horses on public lands and questions the fate of America’s wild horses. 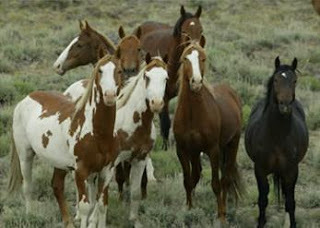 Through interviews with scientific experts, ranchers, historians, wild horse owners, animal rights activist, and others, the film looks at the origins and effects of the recent “Burns Bill” which gutted the Wild Free Roaming Horse and Burro Act of 1971 and cleared the way for the slaughter and removal of a vast majority of these symbols of the American West. The film explores who benefits and who pays the price for the different bills currently under consideration, including pending legislation that would permanently block the Burns Bill, H.R. 249, and H.R. 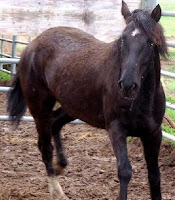 503 and S.311, the American Horse Slaughter Prevention Act. Filming locations included a recent round up conducted by BLM in Disappointment Valley, Colorado of the Spring Creek wild horses. David Glynn was on location August 30th and provides a detailed daily account of his experiences before, during and after the wild horses were removed. One of the most revealing aspects of his narrative include interviews with Dave and Sue Cattoor, operators of Cattoor Livestock Roundups, Inc., one of only two outfits BLM consistently contracts for wild horse removals via helicopters as well as often being contracted for other government agencies such as National Park Service and U.S. Fish & Wildlife Service. Cattoors operations have often faced controversy, which have included the disastrous June 2006 wild horse removals conducted in the Sheldon Hart National Wildlife Refuge that American Wild Horse Preservation Campaign posted extensive photo documentation of (Reality of Roundups – Attempt at a Cover Up) as well as pleading guilty and serving probation for inappropriate use of an aircraft to capture wild horses in the 90’s. Cattoor Livestock Roundups, Inc. were referenced throughout the newest Draft Management Plans recently released by U.S. Fish & Wildlife for the Sheldon wild horses and burros and it appears they will probably contracted to remove wild horses within the Refuge again. The Cattoors were also the sole source of the financial data that projected helicopter round ups were more cost effective than any other capture methods. Wonder how they came up with that conclusion? Wishing James and The American Wild Horse’s debut the very best and praying our elected officials will finally be moved to action on repealing the Burns Bill and enacting The American Horse Slaughter Prevention Act. In May 2007, the Sheldon Hart National Wildlife Refuge located in Northern Nevada estimated that 1,500 wild horses were roaming the Refuge. The May assessment reported severe overpopulation was destroying fragile ecosystems, threatening wildlife, creating hazards to motorists, and their sheer numbers had created a crisis of epic proportions that demanded immediate resolution through the removal of hundreds of wild horses. Then came the lawsuit filed by In Defense of Animals against U.S. Fish & Wildlife Service that was based on the Services failure to provide any current information, pertinent scientific data, accurate reports, follow established laws, procedures, or to consider any reasonable alternatives within their “management plans”. The Service presented one option and one option only – the wild horses and burros must be removed to dangerously low numbers before they completed any serious environmental evaluations in their development of the new management plan currently being drafted. This is not the first time U.S. Fish & Wildlife has been sued for these very same violations and courts have remanded them before for attempting to pass off unsupported and unsubstantiated opinions as legitimate science. After the lawsuit was filed, a new population census was done and low and behold, it is now believed that merely 800 wild horses and 90 burros inhabit the Refuge – a loss of 700 wild horses. The Service theorizes that the 700 wild horses migrated outside Refuge boundaries over the winter and due to the completion of long over due fence maintenance, were unable to migrate back during the spring. If this theory is correct, the Service states that these horses will now be managed by BLM under the Wild Free Roaming Horse & Burro Act but at this time, it is currently unclear which BLM Herd Management Area the Sheldon horses may have ended up in. Just what it is they “monitor” when they report on Refuge conditions? A little over 700 more wild horses were recently removed than was originally projected in the BLM managed Jackson Mountain HMA, bringing the grand total of removals to 990 wild horses. BLMs Preliminary EA estimated only about 250 Jackson Mountain wild horses would need to be removed but a new aerial census conducted in June of 2007 revealed the population was much, much higher than previously believed. BLM attributes the unexpectedly high population levels to wild horses that were driven outside the Jackson Mountain HMA during the February 2003 removals. It is believed that once the removal operations were complete, the wild horses again resumed residence within the HMA boundaries. Kind of makes you wonder how far “outside” the HMA boundaries outside really was? 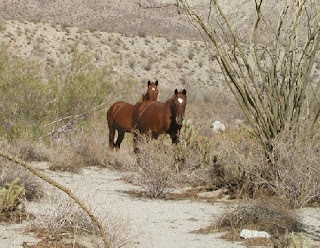 Photo of Sheldon National Wildlife Refuge Wild Horses taken from May 2007 Environmental Assessment and credited to U.S. Fish & Wildlife Service. The Coyote Canyon wild horses, the last remaining herd in Southern California, were abruptly removed in 2003. Their federally protected habitat encompassed 23,260 acres (1) that was transferred from BLM to the California State Park systems and all previously guaranteed legal reservations were withdrawn; the horses were left to the mercy of the State and what mercy California has showed. Yet while the wild horses were being captured, the cameras captured the truth and the wild horses of Coyote Canyon were gleaming, fat and healthy as they were loaded into the trucks for their final journey. Mr. Jorgenson was present at the NHR hearing with a battery of well-rehearsed sidekicks that successfully opposed the Coyote Canyon Wild Horses nomination through more official testimony. This is the Advisory Board that is in charge of overseeing wild horse and burro preservation across the Nation due to laws and federal protection granted to our wild horses and burro that firmly established their historical and cultural significance to the American people. It is not the Boards “responsibility” to investigate or support the preservation of the last remaining wild horse herd in Southern California based on their historical and cultural significance or their documented lineage of the now rare Spanish mustang. Taxpayer funded, BLM appointed positions only, these are the experts and advisors that rubberstamp the hidden agenda of “managing ” wild horses and burros into extinction. 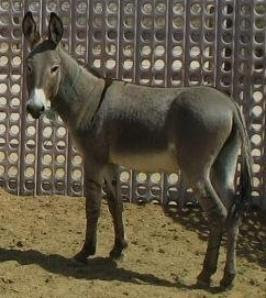 Kathleen Hayden of Coyote Canyon Caballos D'Anza recently announced the arrival of “Harley”, an adopted Clark Mountain burro whose entire herd was zeroed out in January 2007. Harley will now live with the Coyote Canyon wild horses Kathleen also adopted in efforts to preserve the bloodlines of these historic herds. Like the Clark Mountain burros and dozens of herds over the last few decades, the Coyote Canyon wild horses were zeroed out in 2003 and were Southern California’s last remaining wild horse herd. Numbering a mere 29 wild horses when they were taken, highly questionable "Emergency" conditions and authority were used to justify this final blow. The desire to protect big horn sheep was cited as a significant factor in the decision to permanently eliminate both these herds. The Haydens continue to lobby for the return of the Coyote Canyon wild horses based on their cultural and historical significance, their contributions to the diversity of life forms within the Nation and their enrichment to the lives of the American people. Used with Permission - All Rights Reserved. The Clark Mountain burros were one of the oldest and most unique wild burro herds in America. Living in relative isolation for four centuries, their genetic tests revealed the herd had a “high proportion of rare variants”. (1) Yet in January 2007, BLM issued the final orders for their permanent and irrevocable extermination. The Clark Mountain Herd Area is located in Mojave Desert in Southern California near the Nevada border. This transference of key habitat requirements such as water, access or land to other federal agencies not required to protect wild horses and burros is often found at the root of many herds being zeroed out and this trend has been accelerating. Despite being one of the oldest, rarest and last herds left in Southern California, BLM admitted to both managing and rendering this historical population extinct. Public outcry was significant regarding the final eradication of the Clark Mountain burros but pleas to high-ranking officials, including the Secretary of the Interior, fell on deaf ears and were systematically ignored. Volunteers offered to supply all labor and materials to pipe water from the spring to BLM managed land in efforts to preserve the herd but despite this “reasonable alternative”, in January 2007, the BLM removed approximately 100 Clark Mountain burros and the removal of the last remaining 30 wild burros is authorized through 2012. (1) Genetic Analysis of the Chocolate-Mule Mtn., Clark Mtn., Centennial and Slate Range feral burro herds, E. Gus Cothran, Department of Veterinary Science, University of Kentucky, Lexigton, KY 40546-0076, January 24, 2003. Received by BLM February 14, 2003. (2) Clark Mountain Herd Management Area/Herd Area, Decision Record and Finding of No Significant Impact (FONSI) for the Clark Mountain Herd Areas Burro Removal, Fiscal Years 2007-2012, CA-690-EA04-27. Pg. 12, Department of the Interior, CA Needles Field Office, January 2007. 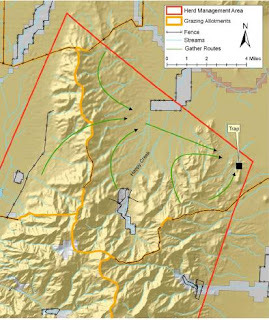 (6), (7), (8) Clark Mountain Herd Management Area/Herd Area, Decision Record and Finding of No Significant Impact (FONSI) for the Clark Mountain Herd Areas Burro Removal, Fiscal Years 2007-2012, CA-690-EA04-27. Department of the Interior, CA Needles Field Office, January 2007. For the former Virginia Range horses who have made their home on the Cheyenne River Sioux Reservation since 2001.
a 30-day notice that the horses must go and ISPMB has been frantically trying to find homes, space and money to prevent the 300 horses from being sold at auction where they risk a slaughterhouse fate. With less than a week left, ISPMB has not been able to coordinate efforts to save them and has sent out another desperate cry for help. It’s Kudrna Nevada LLC specifically; who in late 2005 purchased the 338,000-acre Soldier Meadows Ranch that neighbors the Sheldon Hart National Wildlife Refuge and impacts three BLM Wild Horse & Burro Herd Management Areas- Black Rock Range West, Warm Springs Canyon and Calico Mountains HMAs. Reportedly, the new owner is a very wealthy developer out of Reno, NV that has urged the BLM to modify the current grazing system. The BLM Winnemucca crew (see last post) has been happy to oblige by proposing a new system that allows 800 cattle to roam year round gradually increasing the forage (AUMs) for livestock by approximately 33% versus the old system that fluctuated between 344 and 1,188 cattle depending on the time of year. If that wasn’t enough, in order for the new system to work, another fence must be installed near Idaho Canyon, which is already surrounded on three sides - the new one will box it in completely. As a result, wild horses may become trapped during the winter, possibly causing them to freeze or starve to death. No worries though, BLM has a PLAN! The protection of these horses depends on BLM making sure the gate is opened before it is too late (these are the same people that came up with this idea) or the new owner, Kudrna, can do it too. *Severe damage to springs is the direct results of these thousands of feral horses…. *Unwanted animals are kindly put down. Fortunately, the area won’t ever be horse free because Kudrna plans on raising domestic horses and the Soldier Meadows Guest Ranch includes four wheeling, SUVs and OHV use anywhere with special emphasis on hunting the “wildlife” the wild horses and burros threaten. and public input must be provided by September 26, 2007. So let’s all go see what neighbor Sheldon is planning now……. 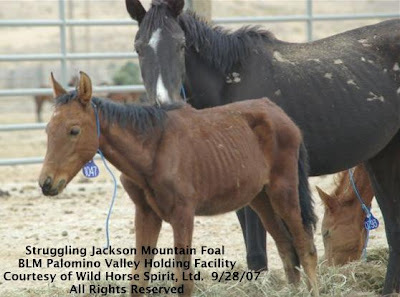 The photo used is of one of the "thousands of unmanaged, unchecked feral horses" removed by BLM in December 2004 from the Calico Herd Management Area in Nevada. The amount of acreage required to create one AUM greatly depends on the area. If the area is lush, it doesn’t take many acres to provide enough food to sustain a cow, horse or five sheep for a month. However, in more arid regions it may take up to 30 acres or more to provide the forage necessary to sustain the same animals. BLM managers take a section of public land and determine how much forage that environment can produce – this is the pie. Then they carve up the pie by giving some to wildlife, some to livestock, some to wild horses and burros and leave some alone in order to support healthy ecosystems. The old standard for issuing forage allocations used to be 50% for all rangeland users and 50% was left untouched. New studies have determined that allocating only 35-40% is “In” for healthy rangelands. When BLM removes wild horses and burros, it is because they are now consuming more pie (AUMs) than what BLM gave them when they were cutting up it up in the “planning process”. Usually BLM issues most of the pie to livestock and often gives only a sliver of AUMs to wild horse and burro herds. This causes them to always be called “excessive”. The photo used is a wild horse removed in January 2003 from the Jackson Mountain HMA located in Northern Nevada with the BLM removing more this August. The Jackson Mountains HMA spans 283,699 acres with an allowable management level not to exceed 217 wild horses or one horse per 1,307 acres. Currently, the BLM is in the process of “carving pie” for the Happy Creek Livestock Grazing Allotment, part of the Jackson Mountain HMA. The old plan gave 3,724 AUMs to livestock and 720 AUMs to the Jackson Mountain wild horses. The new plan still gives 3,724 AUMs to livestock, includes a piece for each big game species but now provides no AUMs for the Jackson Mountain wild horses. BLM is also proposing a new fence that is projected to cause “serious and irreparable impacts to the Jackson Mountain wild horses and their habitat” including entanglement, injury and/or death, lack of access to areas they historically grazed and loss of genetic viability by cutting them off from the rest of the HMA and any other wild horses. If you would like to help wild horses stay wild, drop BLM a line before September 15th and ask that the Happy Creek Grazing Allotment include AUMs (food) for wild horses too, not just livestock and big game. Also, since BLM knows the fence will be dangerous, ask them to find another solution that helps everyone, not just the few, and take pride in your participation to Preserve the Herds. If you do contact them, remember your personal info and comments become part of public record and may be accessed as part of the public information process. Here are some excerpts from a recent article published by the Natural Horse Magazine, Volume 9, Issue 5, authored by Wildlife Ecologist, Craig C. Downer. Mr. Downer is a long time wild horse advocate and has spent years extensively observing and fending for the wild horses and other grazing animals in their natural habitat. He has had several articles published as well, “Wild Horses: Living Symbols of Freedom”, whose Forward was personally written by Velma B. Johnson, (Wild Horse Annie) and his most recent work includes a 341 page, photo illustrated book of poems entitled, "Streams of the Soul" that devotes a section to wild horses in their wild state. Mr. Downer received his A.B. in Biology in 1972 at the University of California at Berkeley and his M.S. in Biology in 1976 at the University of Nevada in Reno. He has extensively traveled Europe, the Middle East, India and Nepal as well as in the United States, Mexico and Canada. He has worked as a wildlife biologist in the Cauca Valley in Colombia, South America and is currently working to save the Endangered Mountain Tapir through the Andean Tapir Fund, which include efforts to establish a Reserve in Northern Peru. Theses excerpts are from a speech Mr. Downer gave along with a slide presentation on June 14th, 2007 at the Carson Valley Museum and Historical Center in Gardnerville, NV, as part of the inauguration of the Mustang Exhibit he also helped prepare. Why has there been such a huge reduction in the wild equid herds? Grasping the history of “civilization”, the answer should not be surprising, but it should be disgusting! Humanity has spread its exploitation of Earth’s natural ecosystems in a very thoughtless and insensitive way and even such magnificent animals as the horses and burros who have long served man have not been exempt from his vicious and ungrateful treatment. Among the primary culprits in wild equid elimination has been the plundering mentality of the livestock culture, which has devastated millions of square miles throughout the world; and any species that has stood in its way has been violently combated and destroyed. But by no means is the livestock culture the lone enemy of wild equids. The hunting establishment has also targeted them, since they are not a game species. They do so in spite of the fact that wild equids ecologically complement rather than compete with deer, antelope, bighorn, and many other species, when man allows their ecosystem enough space and freedom to naturally adapt, interrelate, stabilize and evolve. The huge reduction of the wild equids to their present level of a little over 20,000 nationwide is especially due to the power establishment’s having targeted these noble and ecologically fitting animals for practical elimination. The politicos, including those in academic circles, have outrageously lied about these species, concocting negative propaganda and using them as scapegoats for ecological problems that people – not horses and burros – are responsible for. This is what makes the current attitudes toward and treatment of the naturally living horses and burros so utterly reprehensible and requiring of our immediate attention. While the arrogant and ruthless livestock culture rapes the natural ecosystem to feed an unwholesome appetite for meat and other animal products, and leaves desertification in its ever expanding wake, the returned native wild horses restore the North American ecosystem, seeding its native plants and building the vital humus component of its soils, acting as a natural prey species for native predators such as puma and wolf, and in countless other ways enhancing the biodiverse life community. Yet this regretful situation must not be taken as an excuse to give up. Far from it! We champions of the wild equids, as our exemplars: the wild equids themselves, must be like beacons of light in a dark and storm-tossed sea, showing forth the way to lost ships groping hither and yon. The Wild Horse Act still remains intact! The legal herd areas still are legal herd areas, even if largely empty or populated only by token, non-viable populations. These populations can recover! A caring America can restore their rights in the ecosystems where they are an ancient yet ever self-renewing and evolving part. Think about it: their future is our future, for when we abandon their cause, their freedom, their land, we also abandon a very special and essential element in our very own. For to this degree are the lives and destinies of horses, burros and their kindred linked to those of man. Their true home is a free home, not that of some mere prisoner or slave in a world made prison both by, and ultimately of, man himself! Photo 6. 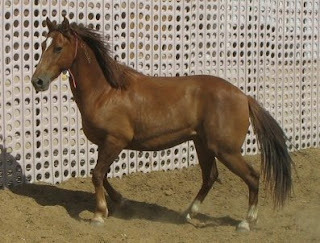 Head mare of a band and mother of colt above. Anyone remotely familiar with how BLM conducts wild horse removals knows that almost all wild stallions are gelded when they are removed from the range. Considering BLM has removed over 70,000 wild horses and burros between October, 2001 and March, 2007, logic would suggest the geldings being supplied to Mexico may be coming straight from our own wild American Herds. At the very least, it should be investigated as to the where this many geldings are coming from and why Mexico needs over 2,000 “non-slaughter” geldings. Another consideration is, according to BLM, as of July 30, 2007, over 2,500 wild horses and burros have been sold under the “Sale Authority” clause granted to BLM by Senator Burns, supposedly as a “stealth rider” that Congress has yet to repeal. This is an amazingly similar number to the geldings shipped for “non-slaughter” purposes through the New Mexico port to Mexico. New Mexico was also home to the Grand Jury Investigation that was slammed shut without further review or any Congressional investigation regarding BLMs alleged black book activities and black market affairs that involved the selling wild horses and burro for slaughter in the mid-nineties. Today, there is no legal consequence to BLM even if they did sell them for slaughter, thanks to Congressional failure to amend the situation. Wouldn’t it be nice if someone actually investigated this to see where those geldings are coming from and what is being done with them or will the geldings just keep rolling through the port “no questions asked”? 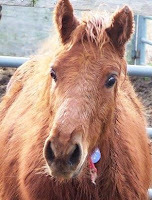 The photo used was taken from a BLM Internet Adoption Site at the Ewing, Illinois facility in April 2007. Nine different “foals” showed up for adoption, all shipped from New Mexico, all “born” in New Mexico holding facilities and all dated November of 2006 - long past foaling season! Speaking of poisoning water to kill wild horses, the Nevada Wild Horse Range has been getting a lot of attention lately for the recent deaths of 71 wild horses. Officials believe their deaths were the results of nitrate contaminated water and their deaths have sparked Senator Reid to call for an investigation into the matter. The Nevada Wild Horse Range was established in 1962 as Nevada’s first and only wild horse sanctuary and most of it falls within the Nellis Air Force Base. The Bureau of Land Management inherited the Range after the passage of the 1971 Wild Horse and Burro Act and has been managing it ever since. The BLM defines a “Range” as a herd that provides “unique viewing opportunities” for the public but even BLM can’t often access the wild horses that roam there, much less the general public, due to strict security issues from military operations. The Nellis horses have always been surrounded by stories of questionable ethics due to the highly restricted nature of their Range. As has already been reported, this was not the first time wild horses have ended up dead in this location and the story about the betting pool of who can shoot the most in horses in the least amount of time has be circulating for quite awhile. One speculation is that Nellis wild horses can easily disappear to slaughterhouses in order to raise some extra cash by those enterprising individuals that can access them. Besides the obvious reasons of this being inappropriate for an animal protected by State and Federal law, there is also the issue that “horse meat” is not subject to inspections like other meat products. The Nellis horses, having spent a lifetime on a military range, may be shipped to European markets with deadly levels of contaminants in their systems with no safeguards or testing. While the poisoned water is getting all the attention, the fact that 178 wild horses were driven for miles during one of the deadliest heat waves in Nevada’s history has received no attention at all. Residents were urged to stay indoors, hospitals received a slew of heat-related check-ins, and pet cautions topped the lists of headline on the local news. Yet BLM forced this grueling gauntlet on the wild horses in order to “save them”. What makes this especially egregious is BLM had been hauling water to the wild horses for two weeks prior to their removals in order to “prevent them from expiring” due to lack of water in the area. So if they were already drinking from the troughs, why didn't they bait-trap them instead of risking their lives and paying the contractor tens of thousands of our tax dollars to do it?Wouldn’t that seem both more humane AND cost-effective? 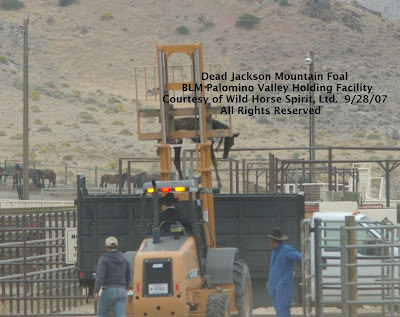 In addition to no public witnesses to what really happened during this questionable capture plan, the photo for this article was recently taken from the BLM Internet Adoption site and the capture date is listed as 9/30/06, the very last day of BLMs fiscal year. Why this matters is, any horses removed from Nellis will not be reported until sometime in December 2007, well over a year after it happened and to the best of my knowledge, no paperwork was ever done that authorized or reported their removals. Just one more example of how the Nellis wild horses keep falling through the cracks and how Las Vegas’s famous motto stretches even here…….